The Connecticut Huskies, also known as the UConn Huskies, are the athletic teams of the University of Connecticut in the United States. 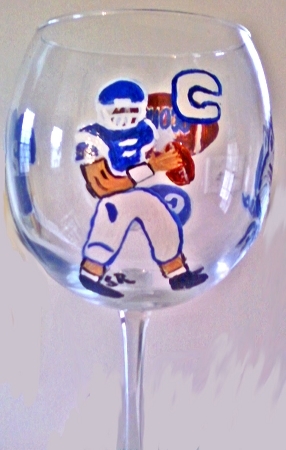 Clearly Susan hand paints sports glassware of University of Connecticut wine glasses with designs of the Huskies logo of the wolf, the school's football helmet, jersey, football player and football all in the colors of the school. 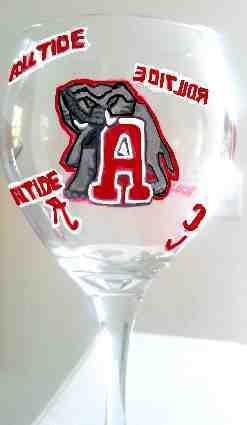 If you have a special request for hand painted sports glasses we paint any school, sports team logo and any personalization then designate in Special Request Box. My husband was thrilled with his University of Connecticut Football Wine Glass. Perfect for the football season. Thank you so much for making his birthday so special. Your detail is excellent and the designs are unique and colorful.